Veracomp is a value added distributor of Polycom solutions for the Adriatic region. Polycom solutions are offered in following countries: Albania, Bosnia and Herzegovina, Montenegro, Croatia, Kosovo, Macedonia, Slovenia and Serbia. Polycom is a global leader in the communications solutions segment known for facilitating productivity, collaboration and communication, regardless of participants’ location, at a low cost of ownership (TCO). Modern businesses demand greater employee mobility and local company presence which increases operating costs. Polycom’s audio-video conference systems reduce travel costs while increasing long-term employee efficiency. Polycom solutions are based on open standards and integrate a series of components to meet the needs of organizations of all sizes. Product range includes everything from IP phones, video conferencing systems to telepresence solutions (Immersive studio), integration with directory domain name services and similar products from other companies (LifeSize, Cisco, etc.) with a strong partnership with Microsoft on developing new audiovisual solutions. We attended this year’s BUG FUTURE SHOW where we introduced and presented Polycom Video Conferencing solution. Participants were able to try Polycom live and attend a lecture on videoconferencing systems held as part of BFS program by our colleague Dario Marušić. We introduced Polycom RealPresence Trio smart hub device that combines all three components of remote collaboration: sound, content and video. 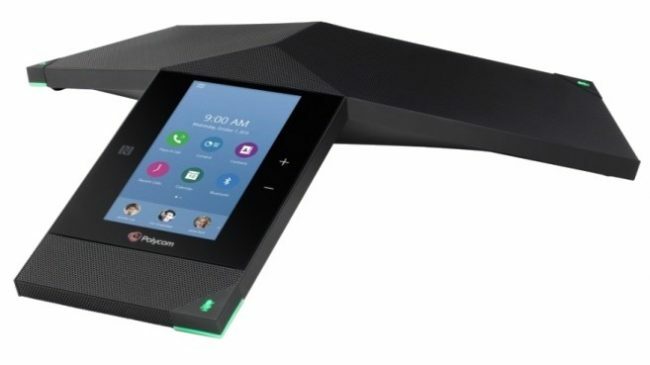 One major feature of Polycom RealPresence Trio is its full integration with Skype 4 Business platform in Office 365 or on-premise environments. The need to communicate remotely with unavoidable assistance provided by specialized technology is greater than ever. Polycom solutions are used in education, health, finance, trade, public sector, pharmaceutical industry, etc. Clear and fast communication is key for achieving success, and more than 415,000 organizations that use Polycom solutions can vouch for this. Veracomp exclusive distributor for Polycom in the Adriatic region!